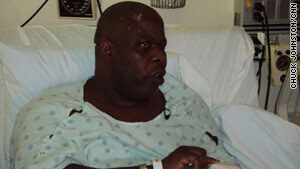 Blind violinist Romel Joseph recovers in a Miami, Florida, hospital from injuries he received in the quake. (CNN) -- Blind violinist Romel Joseph laid in what he called his "grave" for 18 hours. The concrete support beams of his music school in Haiti pinned his legs and feet. Buried in the rubble of the five-story building, Romel realized he was trapped and would not be able to get out on his own. He was overwhelmed by the hot air. He began to have a conversation with God. "I said, 'I would like to know if you are here. I'm really hot ... and don't have much time to live so if you are here, I'm really hot and I need some cool air.' And believe it or not, the next thing I know, there's cool air that got in." He began to pray every hour, for 20 minutes or so, and then came his music. First he pictured himself playing a Tchaikovsky concerto. And then every hour another concerto. "I know I picked the Brahms, the Franz, the Sibelius. I picked several," Romel remembers. "I know a lot of concertos for violins. And I picked the longer ones." And so as the hours passed by, and his friends tried to rescue him from the concrete debris, another prayer, and another concerto took place below. I pictured walking on stage and playing to a full hall. "I pictured walking on stage and playing to a full hall. And you start playing up to the end." His friends were able to remove him from the rubble of the New Victorian School at 11 a.m. the day after the earthquake, about 18 hours later. Later that week, he was airlifted out of Port-au-Prince by the American Embassy to Jackson Memorial Hospital in Miami, Florida. He's being treated for not only the injuries he sustained to his legs, but also a fracture to his left hand. The fracture has left doctors questioning whether Romel will ever be able to play a violin again. Romel is certain he will. "I have to play so they can hear what I want them to play." Romel still has a few weeks left before he will be able to leave the hospital. But once he does, he's already talking about going back to Haiti and wants to begin the rebuilding of the school. On his remarkable story of survival, he says it's all in the way you look at things. "I'm really proud that I was able to be in a horrible place and survive in a constructive, positive way."